Build a raft with simple methods and paddle across the lake. Also for "non-water lovers" a great team and nature experience. 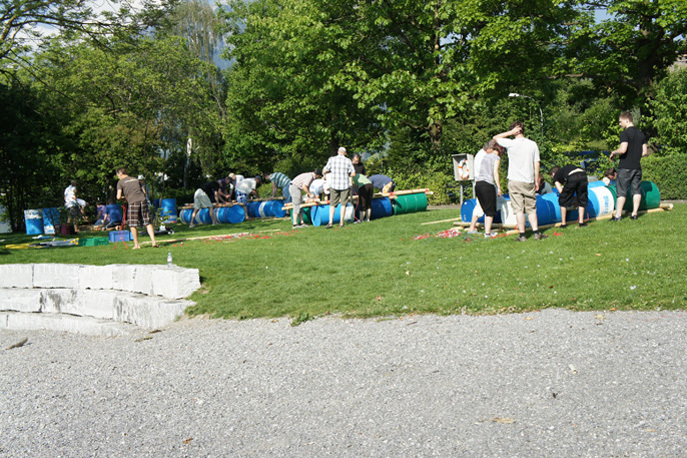 Together with your collegues you build a raft out of barrels, round logs, boards and it will take you over the water. 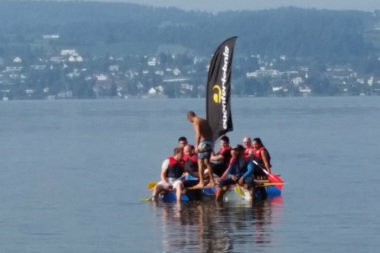 About 5 - 6 people build on one raft. You will receive instructions, tips and tricks from our experienced guide who will take care of you all the time. The goal is to build a portable and floating raft. 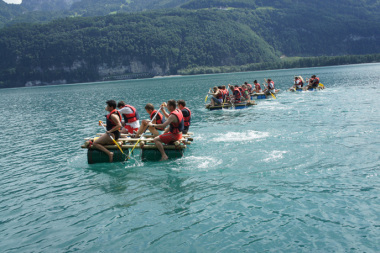 Only those who pursue the goal with passion and team spirit will also get a dry result - a fully functional raft. The perfect mix of physical activity and intellectual challenge is what made this event so popular. After the final check you will put your raft on the water and jump in to set off on an exciting raft trip. You can steer towards beautiful spots, simply drift along and enjoy the sun. In all cases, this outdoor team event promises a great combination of creativity, handiwork, dedication and team work in a beautiful outdoor setting. Non swimmers can also book this event. You will, of course, be given life jackets and will be accompanied by experienced guides. Swimmers will also be able to enjoy a dip in the refreshing water. This event can be carried out in any weather − if it rains, the water will also come from above! After the exhilarating raft trip you can enjoy a "happy landing" aperitif or a delicious BBQ.